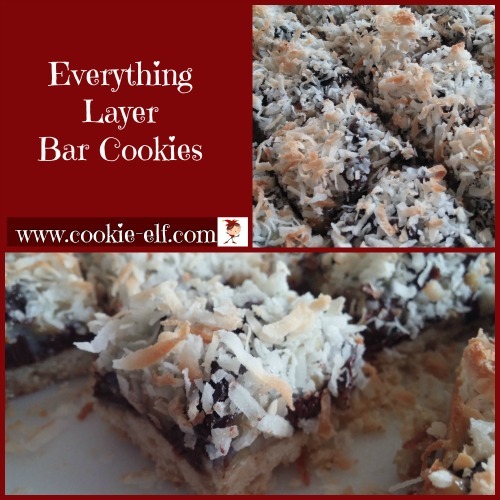 Everything Layer Bar Cookies are an easy bar cookie recipe – and they are always a favorite. Much like Magic Bars, you make these cookies in layers. But this recipe has a twist. You bake the bottom layer first. Once it has set, you remove the baking pan from the oven and add the other layers. And we all know from the name of the recipe that the toppings include all the good stuff in your baking pantry: chocolate, nuts, and dried fruit. You can personalize the “everything” to include your favorites. Start with the classic toppings listed here. Preheat oven to 375º F. Line a 13 x 9 baking pan with parchment paper or aluminum foil, leaving an overhand on both ends. Spray the sides of the liner to prevent bars from sticking to the sides of the pan. In a food processor, using a steel blade, pulse together butter, powdered sugar, flour, and salt until the mixture resembles coarse meal. Add oats and pulse just until the mixture is combined. Press the cookie dough into the bottom of the prepared pan. Bake 20 minutes, until cookie base is firm and lightly browned. Remove baking pan from the oven. Layer chocolate chips, chopped nuts, and raisins evenly over the crust. Pour sweetened condensed milk evenly over bars. Sprinkle coconut on the surface. Bake bars 20 minutes until coconut is golden. Remove the pan from the oven and allow it to cool completely on a wire rack. Grasp ends of the liner and lift bars out of the pan. Set the bars onto a cutting board. Peel away liner. Cut the bars. For variety, substitute dried cranberries for raisins. Set the cooled bars in the refrigerator or freezer for 30 minutes before cutting to get crisp edges. See more easy bar cookie recipes on our Bar Cookies Pinterest board.